This explanation is obviously totally wrong, by the way; that’s not why diamonds are expensive. The marginal-utility argument makes sense for cars (or at least ordinary Fords and Toyotas, for reasons you’ll see in a minute), but it doesn’t explain diamonds. Diamonds are expensive for two reasons: First, the absolutely insane monopoly power of the De Beers cartel; as you might imagine, water would be really expensive too if it were also controlled by a single cartel with the power to fix prices and crush competitors. (For awhile De Beers executives had a standing warrant for their arrest in the United States; recently they pled guilty and paid fines—because, as we all know, rich people never go to prison.) And you can clearly see how diamond prices plummeted when the cartel was weakened in the 1980s. But Smith was writing long before DeBeers, and even now that De Beers only controls 40% of the market so we have an oligopoly instead of a monopoly (it’s a step in the right direction I guess), diamonds are still far more expensive than water. The real reason why diamonds are expensive is that diamonds are a Veblen good; you don’t buy diamonds because you actually want to use diamonds (maybe once in awhile, if you want to make a diamond saw or something). You buy diamonds in order to show off how rich you are. And if your goal is to show how rich you are, higher prices are good; you want it to be really expensive, you’re more likely to buy it if it’s really expensive. That’s why the marginal utility argument doesn’t work for Porsches and Ferraris; they’re Veblen goods too. If the price of a Ferrari suddenly dropped to $10,000, people would realize pretty quickly that they are hard to maintain, have very poor suspensions, and get awful gas mileage. It’s not like you can actually drive at 150 mph without getting some serious speeding tickets. (I guess they look nice?) But if the price of a Prius dropped to $10,000, everyone would buy one. For some people diamonds are also a speculation good; they hope to buy them at one price and sell them at a higher price. This is also how most trading in the stock market works, which is why I’m dubious of how well the stock market actually supports real investment. When we’re talking about Veblen goods and speculation goods, the sky is the limit; any price that someone can pay is a price they might sell at. But all of that is a bit tangential. It’s worth thinking about all the ways that neoclassical theory doesn’t comport with reality, all the cases where price and marginal value become unhinged. But for today I’m going to give the neoclassicists the benefit of the doubt: Suppose it were true. Suppose that markets really were perfectly efficient and everything were priced at its marginal value. Would that even be a good thing? I tend to focus most of my arguments on why a given part of our economic system deviates from optimal efficiency, because once you can convince economists of that they are immediately willing to try to fix it. But what if we had optimal efficiency? Most economists would say that we’re done, we’ve succeeded, everything is good now. (I am suddenly reminded of the Lego song, “Everything is Awesome.”) This notion is dangerously wrong. Of course when you sell a product, the person selling it cares how much you pay, but that will either trace back to someone’s labor—and labor markets are still the issue—or it won’t, in which case as far as I’m concerned it really doesn’t matter. If you make money simply by owning things, our society is giving you an enormous gift simply by allowing that capital income to exist; press the issue much more and we’d be well within our rights to confiscate every dime. Unless and until capital ownership is shared across the entire population and we can use it to create a post-scarcity society, capital income will be a necessary evil at best. The red line is labor supply, the blue line is labor demand. 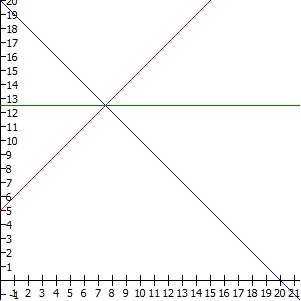 At the intersection is our glorious efficient market equilibrium, in this case at 7.5 hours of work per day (the x-axis) and $12.50 an hour (the y-axis). The green line is the wage, $12.50 per hour. But let’s stop and think for a moment about what this diagram really means. Now let’s consider the blue labor demand line. Is this how much the “job creators” see fit to bestow upon you? No, it’s the marginal value of productivity. The first hour you work each day, you are focused and comfortable, and you can produce a lot of output. The second hour you’re just a little bit fatigued, so you can produce a bit less. By the time you get to hour 8, you’re exhausted, and producing noticeably less output. And if they pushed you past 16 hours, you’d barely produce anything at all. They multiply the amount of products you produce by the price at which they can sell those products, and that’s their demand for your labor. And once again we assume it’s a straight line just to make the math easier. When you add these up for all the hours worked, the result becomes an integral, which is a formal mathematical way of saying “the area between those two lines”. In this case they are triangles of equal size, so we can just use the old standby A = 1/2*b*h. The area of each triangle is 1/2*7.5*7.5 = $28.13. From each day you work, you make $28.13 in consumer surplus and your employer makes $28.13 in profit. And that seems fair, doesn’t it? You split it right down the middle. Both of you are better off than you were, and the economic benefits are shared equally. If this were really how labor markets work, that seems like how things ought to be. But nothing in the laws of economics says that the two areas need to be equal. We tend to draw them that way out of an aesthetic desire for symmetry. But in general they are not, and in some cases they can be vastly unequal. This happens if we have wildly different elasticities, which is a formal term for the relative rates of change of two things. An elasticity of labor supply of 1 would mean that for a 1% increase in wage you’re willing to work 1% more hours, while an elasticity of 10 would mean that for a 1% increase in wage you’re willing to work 10% more hours. Elasticities can also be negative; a labor demand elasticity of -1 would mean that for a 1% increase in wage your employer is willing to hire you for 1% fewer hours. In the graph above, the elasticity of labor supply is exactly 1. 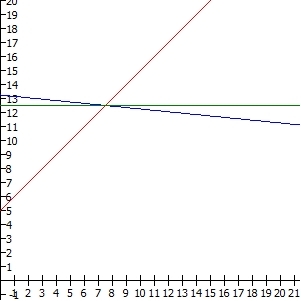 The elasticity of labor demand varies along the curve, but at the equilibrium it is about -1.6. The fact that the profits are shared equally is related to the fact that these two elasticities are close in magnitude but opposite in sign. But now consider this equilibrium, in which I’ve raised the labor elasticity to 10. Notice that the wage and number of hours haven’t change; it’s still 7.5 hours at $12.50 per hour. But now the profits are shared quite unequally indeed; while the employer still gets $28.13, the value for the worker is only 1/2*7.5*0.75 = $2.81. In real terms this means we’ve switched from a job that starts off easy but quickly gets harder to a job that is hard to start with but never gets much harder than that. 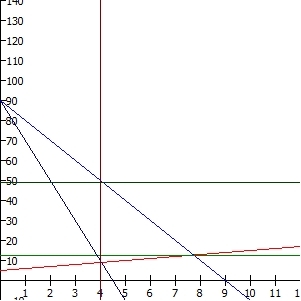 On the other hand what if the supply elasticity is only 0.1? Now the worker surplus isn’t even a triangle; it’s a trapezoid. The area of this trapezoid is 6*12.5+1/2*1.5*12.5 = $84.38. This job starts off easy and fun—so much so that you’d do it for free—but then after 6 hours a day it quickly becomes exhausting and you need to stop. If we had to guess what these jobs are, my suggestion is that maybe the first one is a research assistant, the second one is a garbage collector, and the third one is a video game tester. And thus, even though they are paid about the same (I think that’s true in real life? They all make about $15 an hour or $30k a year), we all agree that the video game tester job is better than the research assistant job which is better than the garbage collector job—which is exactly what the worker surplus figures are saying. What about the demand side? Here’s where it gets really unfair. Going back to our research assistant with a supply elasticity of 1, suppose they’re not really that good a researcher. Their output isn’t wrong, but it’s also not very interesting. They can do the basic statistics, but they aren’t very creative and they don’t have a deep intuition for the subject. This might produce a demand elasticity 10 times larger. The worker surplus remains the same, but the employer surplus is much lower. 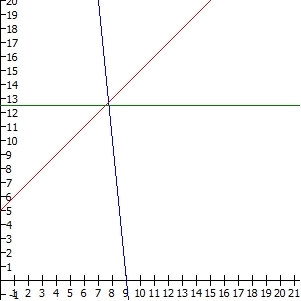 The triangle has an area 1/2*7.5*0.75 = $2.81. You can’t even see the top of the triangle on this scale; it’s literally off the chart. The worker had a lower bound at zero, but there’s no comparable upper bound. (I suppose you could argue the lower bound shouldn’t be there either, since there are kinds of work you’d be willing to do even if you had to pay to do them—like, well, testing video games.) The top of the triangle is actually at about $90, as it turns out, so the area of employer surplus is 1/2*(90-12.5)*7.5 = $290.63. For every day he works, the company gets almost $300, but Einstein himself only gets $28.13 after you include what it costs him to work. (His gross pay is just wage*hours of course, so that’s $93.75.) The total surplus produced is $318.76. Einstein himself only gets a measly 8.9% of that. So here we have three research assistants, who have very different levels of productivity, getting the same pay. But isn’t pay supposed to reflect productivity? Sort of; it’s supposed to reflect marginal productivity. Because Einstein gets worn out and produces at the same level as the mediocre researcher after 7.5 hours of work, since that’s where the equilibrium is that’s what they both get paid. Now maybe Einstein should hold back; he could exercise some monopolistic power over his amazing brain. By only offering to work 4 hours a day, he can force the company to pay him at his marginal productivity for 4 hours a day, which turns out to be $49 an hour. Now he makes a gross pay of $196, with a worker surplus of $171. This diagram is a bit harder to read, so let me walk you through it. The light red and blue lines are the same as before. The darker blue line is the marginal revenue per hour for Einstein, once he factors in the fact that working more hours will mean accepting a lower wage. The optimum for him is when that marginal revenue curve crosses his marginal cost curve, which is the red supply curve. That decides how many hours he will work, namely 4. 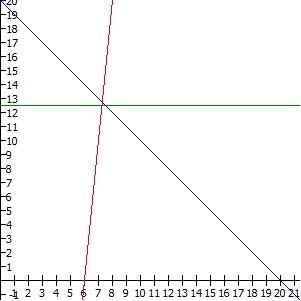 But that’s not the wage he gets; to find that, we move up vertically along the dark red line until we get the company’s demand curve. That tells us what wage the company is willing to pay for the level of marginal productivity Einstein has at 4 hours per day of work—which is the $49 wage he ends up making shown by the dark green line. The lighter lines show what happens if we have a competitive labor market, while the darker lines show what happens if Einstein exercises monopoly power. The company still does pretty well on this deal; they now make an employer surplus of $82. Now, of the total $253 of economic surplus being made, Einstein takes 69%. It’s his brain, so him taking most of the benefit seems fair. But you should notice something: This result is inefficient! There’s a whole triangle between 4 and 7.5 hours that nobody is getting; it’s called the deadweight loss. In this case it is $65.76, the difference between the total surplus in the efficient equilibrium and the inefficient equilibrium. In real terms, this means that research doesn’t get done because Einstein held back in order to demand a higher wage. That’s research that should be done—its benefit exceeds its cost—but nobody is doing it. Well now, maybe that doesn’t seem so fair after all. It seems selfish of him to not do research that needs done just so he can get paid more for what he does. If Einstein has monopoly power, he gets a fair share but the market is inefficient. Removing Einstein’s monopoly power by some sort of regulation would bring us back to efficiency, but it would give most of his share to the company instead. Neither way seems right. How do we solve this problem? I’m honestly not sure. First of all, we rarely know the actual supply and demand elasticities, and when we do it’s generally after painstaking statistical work to determine the aggregate elasticities, which aren’t even what we’re talking about here. These are individual workers. Notice that the problem isn’t due to imperfect information; the company knows full well that Einstein is a golden goose, but they aren’t going to pay him any more than they have to. We could just accept it, I suppose. As long as the productive work gets done, we could shrug our shoulders and not worry about the fact that corporations are capturing most of the value from the hard work of our engineers and scientists. That seems to be the default response, perhaps because it’s the easiest. But it sure doesn’t seem fair to me. One solution might be for the company to voluntarily pay Einstein more, or offer him some sort of performance bonus. I wouldn’t rule out this possibility entirely, but this would require the company to be unusually magnanimous. This won’t happen at most corporations. It might happen for researchers at a university, where the administrators are fellow academics. Or it might happen to a corporate executive because other corporate executives feel solidarity for their fellow corporate executives. That sort of solidarity is most likely why competition hasn’t driven down executive salaries. Theoretically shareholders would have an incentive to choose boards of directors who are willing to work for $20 an hour and elect CEOs who are willing to work for $30 an hour; but in practice old rich White guys feel solidarity with other old rich White guys, and even if there isn’t any direct quid pro quo there is still a general sense that because we are “the same kind of people” we should all look out for each other—and that’s how you get $50 million salaries. And then of course there’s the fact that even publicly-traded companies often have a handful of shareholders who control enough of the shares to win any vote. In some industries, we don’t need to worry about this too much because productivity probably doesn’t really vary that much; just how good can a fry cook truly be? But this is definitely an issue for a lot of scientists and engineers, particularly at entry-level positions. Some scientists are an awful lot better than other scientists, but they still get paid the same. Much more common however is the case where the costs of working vary. Some people may have few alternatives, so their opportunity cost is low, driving their wage down; but that doesn’t mean they actually deserve a lower wage. Or they may be disabled, making it harder to work long hours; but even though they work so much harder their pay is the same, so their net benefit is much smaller. Even though they aren’t any more productive, it still seems like they should be paid more to compensate them for that extra cost of working. At the other end are people who start in a position of wealth and power; they have a high opportunity cost because they have so many other options, so it may take very high pay to attract them; but why do they deserve to be paid more just because they have more to start with? Another option would be some sort of redistribution plan, where we tax the people who are getting a larger share and give it to those who are getting a smaller share. The problem here arises in how exactly you arrange the tax. A theoretical “lump sum tax” where we just figure out the right amount of money and say “Person A: Give $217 to person B! No, we won’t tell you why!” would be optimally efficient because there’s no way it can distort markets if nobody sees it coming; but this is not something we can actually do in the real world. (It also seems a bit draconian; the government doesn’t even tax activities, they just demand arbitrary sums of money?) We’d have to tax profits, or sales, or income; and all of these could potentially introduce distortions and make the market less efficient. We could offer some sort of publicly-funded performance bonus, and for scientists actually we do; it’s called the Nobel Prize. If you are truly the best of the best of the best as Einstein was, you may have a chance at winning the Nobel and getting $1.5 million. But of course that has to be funded somehow, and it only works for the very very top; it doesn’t make much difference to Jane Engineer who is 20% more productive than her colleagues. I don’t find any of these solutions satisfying. This time I really can’t offer a good solution. But I think it’s important to keep the problem in mind. It’s important to always remember that “efficient” does not mean “fair”, and being paid at marginal productivity isn’t the same as being paid for overall productivity.